1. 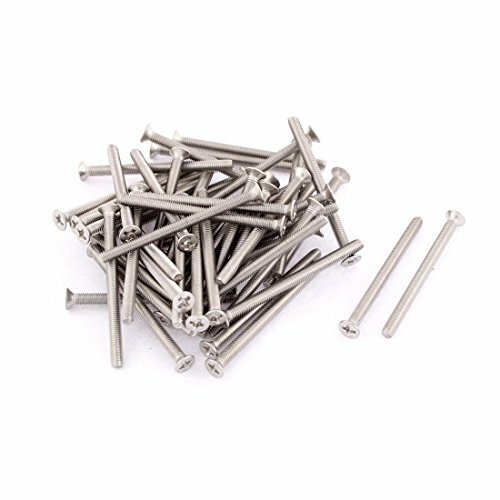 304 stainless steel material countersunk Phillips socket flat head screws M3 x 40mm. Total length: 40mm/1. 6"(L); head diameter): 5mm/0. 2"; head height(k): 2mm/0. 08";thread diameter): M3/3mm; Phillips size: 3mm/0. 12". Drive Type: Philips; main Color: Silver tone; thread Pitch: 0.5mm/0.02"
Total length: 40mm/1.6"(L); head diameter): 5mm/0.2"; head height(k): 2mm/0.08"
Thread diameter): M3/3mm; Philips size: 3mm/0.12"